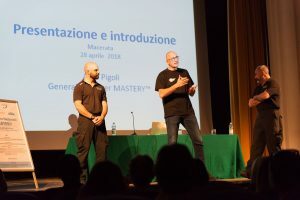 On Saturday 28 April, at the Don Bosco Theatre in Macerata, the sixth national Mastery™ meeting was held, an annual meeting of Mas-Moving Action Surprise System© practitioners. The practitioners of the MAS Method. 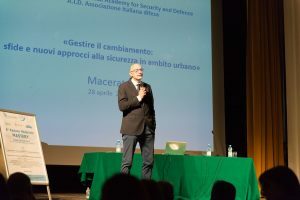 The event, jointly organized by the International Academy for Security and Defence and the Associazione Italiana Difesa (A.I.D., Italian Defence Association), under the patronage of the Municipality of Macerata and Confesercenti of Macerata, was developed during the day and saw the participation of practitioners and instructors from all over Italy. Dr. Pigoli presents the objectives of MASTERY™ training activities. The first part of the day was dedicated to the practical aspect of the MAS Method. 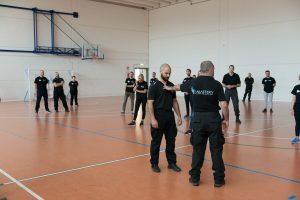 In the presence of the Head Master MASTERY™, M° Remo Grassetti, creator of the MAS Method – Moving Action Surprise System©, several theoretical and practical activities of training in the prevention and management of critical situations and personal defence were carried out. The initial phase of the training, focused on the adoption of a correct posture and on the dynamic management of the distance, elements of fundamental importance to guarantee prevention and effectiveness. The training session was enriched by the involvement of experts in the field of psychology and well-being: Silvia Bartoli, head of the psychiatric rehabilitation unit of the AUSL in Rimini and Carlo Robuschi, postulogist and kinesiologist. Dr. Bartoli has deepened from a psychological point of view the concept of stress management and emotions underlying the MAS Method. Fundamental in the prevention and management of critical situations is the awareness of one’s body and mind. In this sense, anxiety, generally considered as our enemy, plays an important role in preventing situations of difficulty to the extent that it can be considered as our ally. Therefore, in its original state, it is an innate and positive emotion since it has an adaptive character, indispensable in situations of danger. Only through proper management of anxiety is it possible to implement effective and appropriate behavior. The training phase dedicated to the themes of posture and breathing. Carlo Robuschi has deepened the themes of posture, breathing and management of psycho-physical traumas, with an approach aimed at analyzing and developing the ways in which each individual manages the primordial impulse of survival. From a physical point of view, Dr. Robuschi emphasized the mechanisms of breathing to restore the structural balance and especially relieve the tensions caused by physical and emotional trauma. In the final part of his speech, Dr. Robuschi highlighted the natural mechanisms that our body has to relieve tensions. From 4.45 p.m., the informative and in-depth conference entitled “Managing Change: Challenges and New Approaches to Urban Security” was held. The initiative was born with the intention of creating an opportunity for discussion on security issues, analyzing the challenges and critical issues related to the impact that national security has on the local fabric. The meeting, opened and moderated by Prof. Aldo Pigoli of the Catholic University of the Sacred Heart of Milan, was attended by numerous professionals in the field. 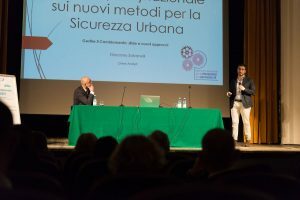 Dr. Giacomo Salvanelli, Criminologist and Crime Analyst for the C.R.P.A., The Research Center for the Prevention of Antisociality, examined the environmental factors underlying crime in the Marche region, with particular focus on the case of Macerata. Specifically, Salvanelli highlighted the importance of these factors in the implementation of preventive computer models that can be put at the service of the community and local authorities. Dr. Salvanelli also highlighted how the C.R.P.A., in collaboration with the Police of Macerata, is working to ensure that even the small reality of the Marche region can benefit from these technologies. The intervention of Dr. Giacomo Salvanelli. Thereafter, the senator Giacomo Stucchi, President of the Co.Pa.Si.R , Parliamentary Committee for the Security of the Republic, has analyzed the multiform dimension of security, material and immaterial, affirming how the available technologies must be considered as a useful instrument in assuring a response to the risk prevention. Stucchi has also faced the theme of fear determined by the so-called perceived insecurity, arguing in favour the action of the Italian Intelligence. Specifically, Stucchi called for a general rationalization of the threat, which is necessary in such a changing context. The intervention of Senator Giacomo Stucchi. 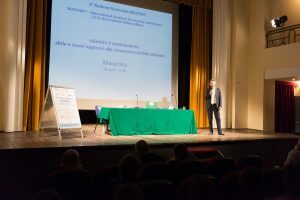 Subsequently, Dr. Marcello Gasparini, formerly first director of the State Police at the Police Headquarters of Macerata, went into detail on the prevention and law enforcement of the police in Macerata and nationally. Dr. Gasparini, analyzing the social liquidity of our time, highlighted how the perception of insecurity has important repercussions on the choices of citizens. In this sense, security operators are therefore called upon to multiply their preventive efforts, directing them to a high organizational, IT and strategic level, but also returning to the central role of the operator within the territory. General Pierluigi Leonarduzzi, former director of the I.S.S.M.I., Joint Services Staff College(Istituto Superiore di Stato Maggiore Interforze), reflected on the theme of formation. At a time when the perception of security is strongly influenced by the correct management of information, the training of each individual citizen is fundamental. Finally, Leonarduzzi highlighted the role of the military as an actor close to society and active in prevention. M° Remo Grassetti, Head Master of MASTERY™ and creator of the MAS – Moving Action Surprise System Method©, in presenting the usefulness of the method of prevention and management of critical situations, stated that training, for an operator as for the citizen, requires more and more professionalism and prevention skills, before management. The seminar was concluded by Maurizio Verdenelli, a professional journalist with a deep knowledge of the local context of Macerata. 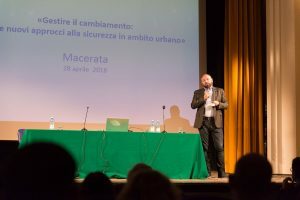 Verdenelli, starting from an analysis of the transformation of the social fabric, stressed the impossibility of considering Macerata as an island of happiness, underlining the need for new policies to be implemented with respect to urban security. The speakers and organizers of the conference. 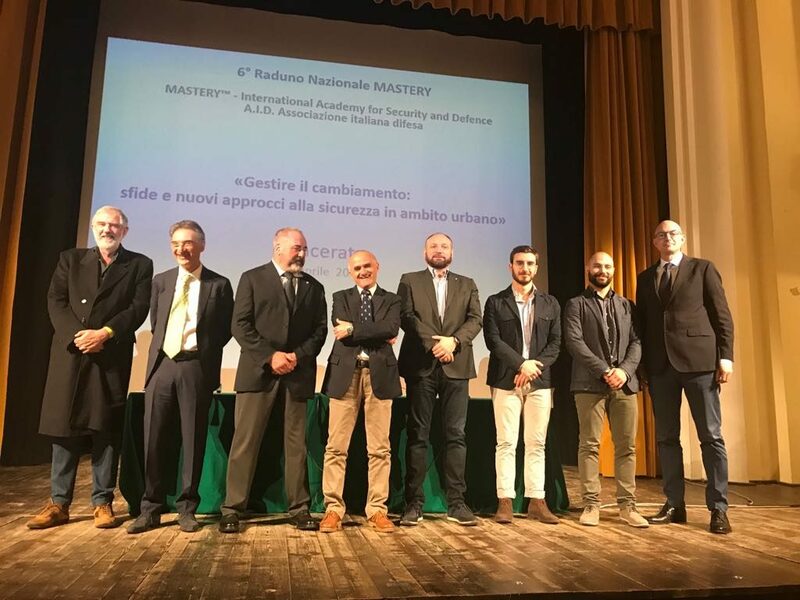 The management of MASTERY™ – International Academy for Security and Defence would like to thank the municipal administration of Macerata and Confesercenti of Macerata for their support in organizing and communicating the event.